This, believe it or not, is one sentence in the original language – a state of affairs that would not be tolerated in any English class. Then again, Paul did not take English! For this reason I bow my knees before the Father,  from whom every family in heaven and on earth is named,  that according to the riches of his glory he may grant you to be strengthened with power through his Spirit in your inner being,  so that Christ may dwell in your hearts through faith—that you, being rooted and grounded in love,  may have strength to comprehend with all the saints what is the breadth and length and height and depth,  and to know the love of Christ that surpasses knowledge, that you may be filled with all the fullness of God. We think that analysis is good, so far as it goes, but sometimes a passage, such as this one is not subject to analysis (remember I am talking the Greek, not the various English translations.) It is a bit like the scene at the start of the movie, “The Dead Poets Society”, where Robin Williams reads a scholar who wanted to turn poetry into a graph. He instructs the class to rip out the offending page, and then “feel” the poetry. Our analysis would put the emphasis on the phrases “so that Christ may dwell in your hearts through faith” and “that you may be filled to the measure of all the fullness of God.” (NIV) On the other hand as a preacher, one could dip into this sentence and talk about any phrase. It is so rich with meaning, that even the secondary phrases are worth study, for example “from whom every family in heaven and on earth is named.” (Greek “Father” is “pater” and “family” is “patria” – a word play lost in English). In our congregation’s reading schedule we have been in Isaiah. Now Isaiah contains some of the most elevated language of the bible – not just well known passages such as chapters 44, 53 and 55 and to think of it 2, 7, 9 and 11 regarding the Messiah and peace and justice. It is a diamond field of great passages such as this. 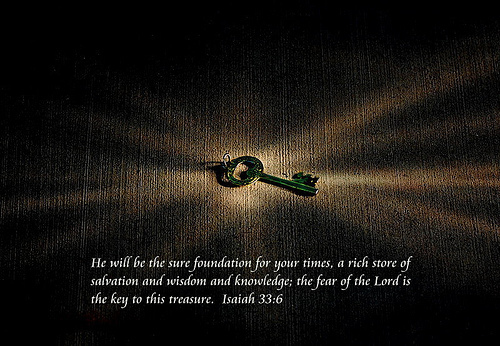 In the New International Version that last phrase is: “the fear of the Lord is the key to this treasure.” So we have a good prophetic sounding affirmation of the majesty of God – a concern with his justice and righteousness – concepts that we tend to separate more than the biblical authors. The last phrase is reminiscent of the prominent theme of wisdom literature – the Fear of the Lord. This attitude of respectful awe and willingness to follow is seen in Wisdom Literature as an opening to Wisdom. “the fear of the Lord is the beginning of knowledge” is a well known statement from the opening chapter of Proverbs. I have seen a few scholars suggest that the prophets and the sages (wisdom teachers) were in conflict – but this one suggests a harmony of purpose. We are in a book group discussing O. T. Theology. The author of the book, Bruce Waltke, says that the bible is a revealed, inspired text. The text is open to all for reading and scholarly analysis, regardless of ones spiritual commitment. However, the idea of revelation means that somehow God has “spoken” by the biblical text. The idea of inspiration is that somehow the authors were brought to the place where they wrote the message God wished to make. He says that these latter two categories indicate that a spiritual commitment is necessary for a full reading of the Scriptures as they were intended to be read. So we are getting into the difference between scholarship and faith. Also, Waltke speaks of the need for “illumination”. That is the text is in some way dark or incomprehensible to me apart from a spiritual clarifying of the text. So is the text open to all? Does the author need to help the reader get it? Can one read it fully in only a scientific manner? Check out: Ephesians 3:14-18; I Corinthians 1,2; and the frequent expression “he who has ears to hear, let him hear.” e.g.. Mark 4:9 and it’s context. We are part of a multi-lingual congregation. In recent years we’ve had the experience of sharing a message or study on the same passage with different cultural groups. It can be a challenge. Here in Wisconsin, preachers are used to using football illustrations, for example. That is lost on at least one of the groups here who come from Asia where American football is not big. So we are constantly confronted with how much we are influenced in our thinking and reading by our culture. If that is a bad thing, too bad. We can not escape culture. It is a good thing to find ways to listen through the eyes and ears of another culture. One way is to simply read books from other eras, or books in translation from other cultures. C. S. Lewis suggested that readers ought to alternate between historic or classic texts and contemporary ones. Another way is to be associated with people who are from another country, ethnicity and/or language. Listen and observe. Notice the differences and see what you can learn from them. We have noticed our Spanish speaking brothers and sisters use the expression “for the love of Lord” much more frequently that we do. (“…para el amo de dios..”). We have noticed an attitude of quiet reverence with our Chinese speaking fellow believers – hmmm. We have seen that our own kids, separated by 30 years of culture, TV, Internet, Face book, You Tube, i Pod, etc. are also of another culture. The saying goes, that is why we have two ears and only one mouth. We think culture is good, and the more you are open to listening to others, the better you are. We will not be served well by the posture of the Ostrich, with our heads in the cultural sands. Don’t try to outline it in a linear fashion. Don’t obsess over seeming contradictions – a skilled author uses “contradictions” to get our attention. Our favorite commentator is Jacques Ellul’s out of print Reason for Being, where he advocates a literary reading of the book, and sees not an outline so much as a tapestry of themes. It is worth searching Powells, Amazon or your favorite source of used books to find this gem. Wisdom, as a gift of the Creator, is Qoheleth’s (“the preacher”) other option for the Rat Race. FR is a preacher bc of this book, and some other personal narrative for another time.